The Theory of Investment Value - IFA Vintage and Current Book Library - Index Fund Advisors, Inc.
Notes: Reprint of Economic Classics, green buckram with red and gold title box on spine, text with tables and charts, some fold outs, general shelf wear, front hinge cracked, rubbed cover, few pencil markings, page 101 has a cut on side of margin, but doesn't effect text, usual ex-library treatments are present. Just as Benjamin Graham is considered to be the father of value investing, John Burr Williams rightfully deserves to be recognized as the progenitor of dividend investing. The influence of his seminal work, first published in 1938, has been widespread, and today the book remains as relevant as ever. 1. Focus on Dividends, Not Earnings. Williams was a security analyst who sought a better understanding of what caused the stock market crash of 1929 and the subsequent Great Depression. He enrolled as a PhD student at Harvard, and his thesis, which was to explore the intrinsic value of common stocks, was published as The Theory of Investment Value. Breaking with commonly held beliefs at the time, the crux of Williams’ theory was that the intrinsic value of a company was equal to the present value of its future dividends, not earnings. “Earnings are only a means to an end,” Williams argued, “and the means should not be mistaken for the end. Therefore, we must say that a stock derives its value from its dividends, not its earnings. Williams shared many of Graham's views when it came to drawing a distinction between investing and speculating. Williams defined an investor as “a buyer interested in dividends, or coupons and principal,” and a speculator as “a buyer interested in the resale price” alone. Williams thought the volatility of the stock market did not accurately reflect the capacity of companies to pay dividends, and he saw the 1929 stock market crash as “a serious indictment of past practice” of investment analysis. He asserted that if there had been agreement among analysts regarding the “proper criteria of value,” the wild price swings experienced in the crash and its aftermath might have been avoided. With his book, Williams hoped to encourage more true investing and less speculation. Despite the stock market’s volatility, both Williams and Graham took issue with the “casino capitalism” theory espoused by John Maynard Keynes in his famous General Theory of Employment, Interest, and Money (1936) which pointed, critically, to the boom and bust cycles of stocks. “It is usually agreed that casinos should, in the public interest, be inaccessible and expensive,” Keynes wrote, “And perhaps the same is true of Stock Exchanges.” In contrast, Williams and Graham both saw the benefits of free markets but, importantly, also the need for rigorous analysis in the determination of intrinsic value. Among the first to advocate for a theory of valuation based on discount cash flow, Williams referred to his forecasting approach as “algebraic budgeting,” and he undoubtedly influenced the thinking of some of the greatest investment theoreticians and practitioners of the past century. And Warren Buffet, in Berkshire Hathaway's 1992 Annual Report wrote the following: “In The Theory of Investment Value, written over 50 years ago, John Burr Williams set forth the equation for value, which we condense here: The value of any stock, bond, or business today is determined by the cash inflows and outflows—discounted at an appropriate interest rate—that can be expected to occur during the remaining life of the asset.” Though Buffett may have tweaked Williams’ theory slightly, his investment success serves as a testament to the validity of Williams’ work. 4. On Government, Socialism, and Taxes. Williams was not a fan of big government. In a chapter titled “Taxes and Socialism,” he made clear his belief that government was a poor steward of the economy. Williams argued that taxes were a drag on savings, investment, earnings, and ultimately, the value of securities. In Williams’ view, government deficits carried with them the threat of higher taxes, and “the mere prospect of higher taxes is sufficient to discourage investment in capital goods.” Williams further warned that the redistributive nature of excessive taxation, and government control of key industries, would put the United States on a path toward socialism. 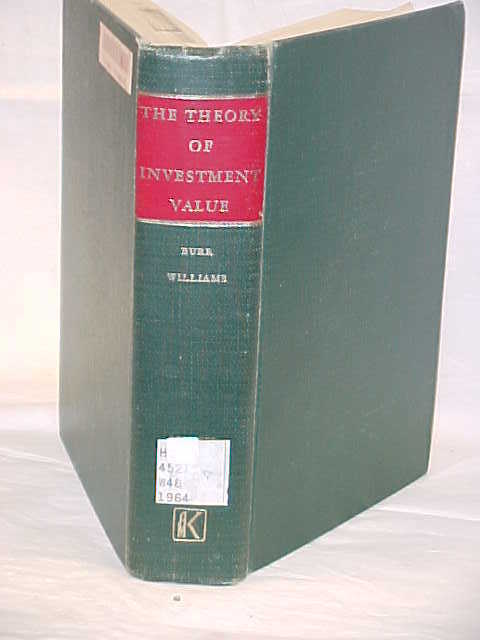 Politics aside, Williams and The Theory of Investment Value offer timeless lessons on the concept of intrinsic value, the importance of dividends, and the value of a long-term perspective. In an era of heightened volatility and low investment returns, these lessons are more important than ever.